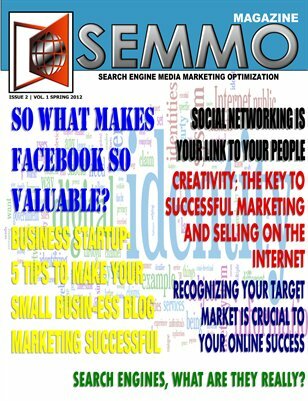 In this edition find out just how valuable Facebook is to your SEO and online business. Also get tips on optimizing your blog marketing to increase targeted visitors. Do you understand the true importance of keywords? Well get this edition and make sure you are using them for the optimal SEM and SMM. All this and more in the Spring SEMMO Magazine edition.